The Model S is a very unique car and both the car and Tesla make for different tire experiences than you might have with a standard car. The Model S is insanely quick and all this power translates to your tires. The Model S is also heavier than a normal car thanks to the amazing battery that powers it — this translates to extra force on your tires as you round corners. The Model S recharges itself as you decelerate using regenerative braking — this translates to reverse force on your tires. To counter some of these extra forces Tesla has modified the way the wheels are angled on the car (camber, toe in and other things I know little about). 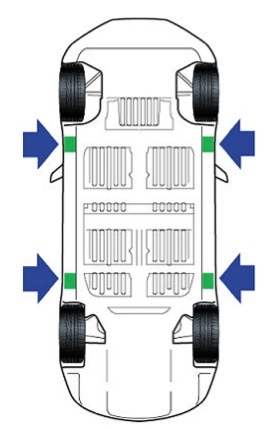 To improve range they’ve include low rolling resistance tires. All of these factors add up to some special tire care that you may not have perviously been exposed to. First, all my experience and research has been with the standard 19″ wheels and the Michelin Primacy MXM4 all-season tires that came standard with my car. While some of this will apply to the 21″ high performance tires too, I recommend you do your own research with those. You will get much less mileage out of the 21″ tires. With the “W” rating on my standard tires, they have a manufacturer tread wear warranty to 45,000 miles. On my 2007 Acura MDX SUV I got an average of 53,000 miles on a set of tires and after some research i’ve decided i’ll be happy if I get 40,000 out of the tires on the Model S.
I’ll be happy if I get 40,000 out of the tires on the Model S.
From the owner’s manual, Tesla recommends rotating the tires every 5,000 miles (8000 km). They specifically tell you not to rotate tires on the Performance Plus models, so beware those differences. With most gas-powered cars they generally recommend rotating your tires every other oil change, or about every 10,000 miles. So the tire rotations on the Model S are much more frequent. Tire rotations on the Model S are much more frequent. The tires on the Model S are what they call directional tires — they’re designed to roll in a specific direction. This means when you rotate tires you keep them on the same side of the car and swap the front left tire for the rear left tire and then do the same on the right side. The picture to the right is Tesla’s recommended rotation pattern. Due to the weight of the car, the nuts on the wheels are tightened more than most cars and this specification wasn’t in any of the manuals I received. After some research, whether you have the 21″ or 19″ wheels, Tesla recommends 175Nm or 129lb/ft of torque for the wheel nuts. Not all shops will measure this and be precise but with higher performance cars its important that the setting is reasonably close to the recommendation and consistent. When the car is lifted you also need to be careful that they use the designated lift locations on the car so that they don’t damage the battery. That battery costs about $40,000 and the warranty does not cover damage due to improper lifting so you really want to make sure it’s not damaged when the car is lifted. Most shops will need to make some minor adjustments to line up their lift to properly lift the Model S at the designated locations, but properly warned this is not a big deal for them. The picture to the right (also from the owner’s manual) indicates the proper lift locations. They key point is those are on the frame and not on the battery. Unfortunately, we cannot recommend third party service centers. Frustrated, I reached out to fellow local Tesla owners via the TMC Forums and got a few local recommendations of the usual sorts like Town Fair Tire, Direct Tire, NTB, etc. None were strong recommendations (i.e. no local owner had used these themselves) and the internet reviews were a very mixed bag leaving me nervous about quality, cost and wait times. I reached back out to Tesla and let them know I wasn’t really comfortable with a third party tire shop and they said I could bring my Model S to Watertown on a Saturday AM and wait for service with a first come, first serve sort of process. The Watertown service center is 60 miles from my house and my Saturdays are full so that wasn’t going to work for me. When I pushed on this they offered to send a Ranger to service my car. This sounded involved and possibly expensive (I didn’t ask) and i’m going to have to do this all the time so I chose to look around a bit more. My take on all this was that the Service Center is really focussing on deliveries (the Watertown Service Center is also the only local Delivery Center) and real issues that need Tesla expertise and tire stuff is something they only do reluctantly or when they’re working on other things too, although they were not very upfront about this. I don’t blame them for focussing on more important things, but they should change their policy to allow them to recommend some trusted tire shops. Tire stuff is something they only do reluctantly or when they’re working on other things too. I brooded on this dilemma for a while then came up with a crazy idea. I know the service people at my local Acura dealer well — they’ve serviced my Acura for 7 years with oil changes, tire rotations, various engine/belt related matters, etc. I trusted them and they did a good job. They were always encouraging me to bring my other car makes there for service. I called up Joe at Acura and explained my situation and he scheduled me for an appointment with less than 24 hours notice — a far cry from the 3 week scheduling for service Tesla currently has in our area. Scale matters. Tesla should change its policy to allow recommendations of trusted tire shops. I went to the Acura dealer well armed. I printed out the tire rotation pattern, the indicated lift points, and wrote the nut torque on the sheets. Then I spoke to the service manager then the mechanic to make sure they understood it all. They were excited to see the car and learn about it and I had many Tesla moments. The actual rotation didn’t take very long, less than an hour from the time I arrived and much of that time was them learning about the Model S (they were baffled by the inability to turn it off), adjusting their jack system to jack in the right spots and a test drive. I monitored the car from the Tesla app during the process and watched the car zip down the street at the end of the service. I won’t say if they did anything illegal when they “tested” the tires, but I will say that the mechanic came back with a huge Tesla grin on his face and told me what an amazing car it was which was the best part of the entire process. The mechanic came back with a huge Tesla grin on his face. The whole process of scheduling the appointment, getting the rotation done and paying was easy and I trusted the team. The total cost was $31 which is less than many places would charge. Tesla is still a small company with not enough service centers or employees to keep up with their amazing growth. While the Model S doesn’t have a lot of normal maintenance that needs to be done, tire rotations are something you’ll have to deal with and Tesla isn’t well prepared for this maintenance volume in all areas. For me the solution was to use my old trusted dealer for this basic maintenance. Many people own more than one car and this may well be a viable option for them too. While i’m sure some tire-specific places will do a perfectly reasonable job, I wasn’t ready to trust my $100,000 car to someone I didn’t know or have strong recommendations for and when they would have to deal with the few oddities of the Model S.
I’ll be back to Acura in a couple months for my next rotation and to catch up with my friendly service manager. I don’t get to see him much any more now that I own a car that is almost maintenance-free. p.s. Elon, you got rid of the engine, can you eliminate tires next? Very difficult navigation on your blog; it assumes a daily reader who comes in each day to find a new post at the top. Trying to read past posts in chronological order is a reverse-sort nightmare. I agree. I’ve been trying to find a better index option in wordpress. Haven’t figured it out yet though.